We are interested in finding the power consumption of the public lighting in Spain and to compare it with those of European countries. 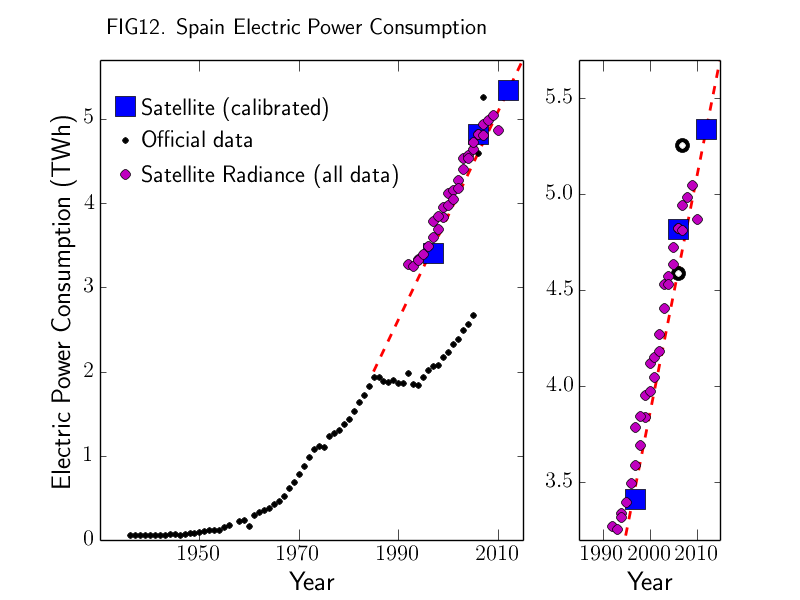 The spanish budget for public lighting shows an extraordinay grow which translates to an increase of light pollution. Our research is performed with official statistics on electrical power and analyzing images of the Earth at Night taken from satellites. Official statistics on electric power consumption on public lighting for the past years are not reliable. The estimated values, using DMSP-OLS data, is represented with a red dashed line. The growth is around 4% per year. A. Sánchez de Miguel et al. "X Reunión Científica de la Sociedad Española de Astronomía (SEA), 9-13 July 2012, Valencia (Spain). (En prensa)"
Sánchez de Miguel, A. & Zamorano, J. "Differential Photometry Study of the European Light Emission to the Space"